Our mission here is two-fold. We want to deliver safer and more efficient project sites for our workforce and our clients. By utilizing our own forces, we can better control these outcomes. Gilbane Building Company announces the addition of Omar McIntosh to lead the firm’s self-performance division and workforce in the mid-Atlantic region. He brings over 20 years of industry experience and strong relationships with regional clients, subcontractors and diverse workforce leaders. Mr. McIntosh will direct and manage all business functions for project site services which include field engineering, general carpentry and labor, and central management of site vendors. As former president of his own commercial construction firm, Mr. McIntosh states, “Our mission here is two-fold. We want to deliver safer and more efficient project sites for our workforce and our clients. By utilizing our own forces, we can better control these outcomes. In addition, we are recruiting a diverse workforce of tradespeople who reside in the communities where we work while providing opportunities for career growth and access to award-winning training programs for them.” Representative construction skills for the workforce include small equipment operators, skilled and unskilled laborers, and carpenters. Procurement of tools and equipment are also managed under the division. Mr. McIntosh will leverage best practices from other metropolitan centered self-perform divisions that Gilbane operates. Mr. McIntosh earned his Masters in Business Administration from the Carey Business School at John Hopkins University and holds a Bachelor of Science in Civil Engineering from Morgan State University. 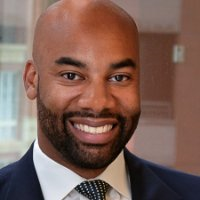 He serves on several boards including the ACE Mentor Program DC Affiliate, Morgan State University Foundation, African American Real Estate Professionals, Inc. and is a youth committee member for the Prince George’s County Economic Development Corporation. His former experience includes projects for Rolls-Royce, Smithsonian National Museum of the American Indian, Department of Justice, and a host of local property owners and developers. Gilbane Building Company provides a full slate of construction and facilities-related services—from preconstruction planning and integrated consulting capabilities, to comprehensive construction management, close-out and facility management services—for clients across various markets. Founded in 1873 and still a privately held, family-owned company, Gilbane has more than 50 office locations around the world. Gilbane’s mid-Atlantic offices are located in Arlington, VA/Washington DC; Baltimore, MD and Richmond, VA. Collaborating with clients in the region since 1969, Gilbane serves diversified market sectors. Representative regional clients include Navy Federal Credit Union, Inova Health Systems, John Hopkins Hospital, Vornado/Charles E. Smith, Georgetown University, Virginia Tech, University of Virginia, Virginia Commonwealth University, Highmark Development, Tishman Speyer, General Services Administration, and Capital One.